"From Your Lips, To God's Ears!" There's a lot been going on behind the scenes. So here's a quick update! Wish I was a "Cool Kid". Here's a brief summary of 'The Walcotts' trip to Nashville: A man played a conch shell solo, and a 4yr-old boy stole the show... Now to be fair, there were a lot of other great moments, but those will certainly be memories near and dear to all of our hearts! I had never been to Nashville before last weekend, but I'd heard a lot about the music loving city, the great musicianship and how friendly everyone was there. All true! 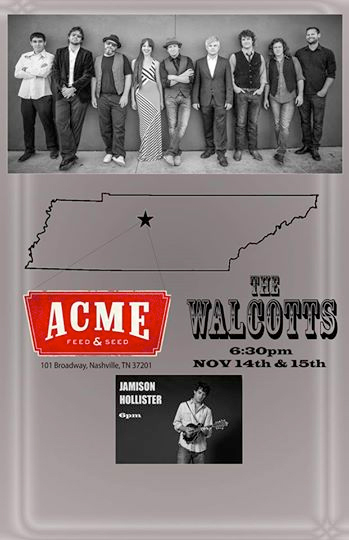 The Walcotts were lucky enough to be asked to play two nights at a new venue called 'Acme Feed and Seed'. The set was roughly and hour and a half, and we threw in a few oldies, but goodies. The venue was jumping both nights and we had a blast entertaining such an appreciative music crowd. Joining us for the weekend were a couple of local brass players weekend, and the picture below is of our trombonist, Roland, playing the conch shell - we had no idea he had one, and just started playing during a solo in a song. He was palying percussion and all sorts during the set. What a player and what a surprise! 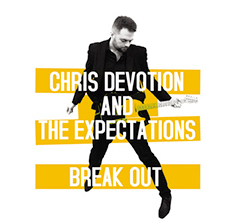 "From your lips to God's ears..."
Ok, if you haven't rocked out to Chris Devotion and The Expectations yet, then I take full credit for introducing you and you can thank me later at a bar with a beer! I've known, loved, and recorded with these guys on their last two records.They've been gigging a lot recently, and I miss them being over here in L.A. Fingers crossed they tour over heresoon. Their latest album, Breakout, is just stunning. And it was a real pleasure getting asked to play on it. It's just the ballsy punk, rock, indie vibe we've come to know and love. Great harmonies and loads of loud guitar. I played it recently on a trip to San Diego, and I forgot how short (but perfectly formed) it is. 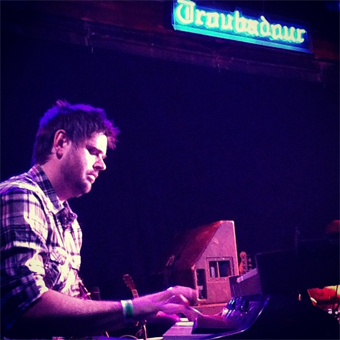 A big thanks must now be extended to Rami Jaffee for the use of his Hammond and piano at Fonogenic Studio. And to Samon Rajabnik for (as always) making it all sound so damn good on the record. My favourite track is 'From Your Lips To God's Ears'. As if you hadn't guessed by the top of the post! "There's a civil war coming..."
Finally! 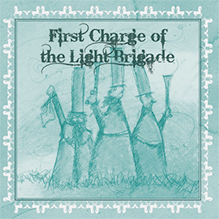 The much anticipated, self-titled, début album of the First Charge of The Light Brigade has arrived! And it was totally worth the wait! "With their own brand of country-laced folk-pop that rests comfortably amongst many contemporary favourites such as Teenage Fanclub, Wilco and Trashcan Sinatras, First Charge of the Light Brigade’s sound also evokes memories of past luminaries such as Big Star and The Byrds." Well, things are really starting to pick up for The Walcotts. After a great gig opening and backing Caitlin Rose at The Bootleg Theatre, followed by a successful San Francisco trip, including The Great American Music Hall and Hardly Strictly Bluegrass Festival. 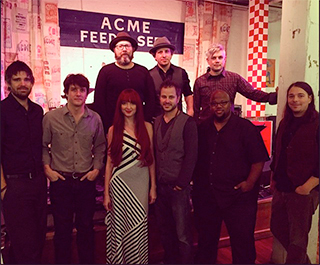 Our intrepid musical explorers are heading off to Nashville, for a few days of fun. I'll be sure to take a few pics, if for no other reason than to remind me of where we went, and who stole my cowboy hat. But all joking aside, it'll be great to take the songs out of California, and see how they go down with another audience. Here's another plug for the EP, but trust me it's worth it. Somehow we've managed to take all that energy and raucous fun we have on stage, and squeeze it into a digital recording, for your listeneing pleasure. And don't forget it's got my first writing credit with the band, on a song called "So Much For Love." It's been a busy few months for The Walcotts, with the imminent release of our third EP. It includes a fantastic cover (that I can't say anything about just now, but it's worth the wait), and also my first writing credit with the band, on a song called "So Much For Love." 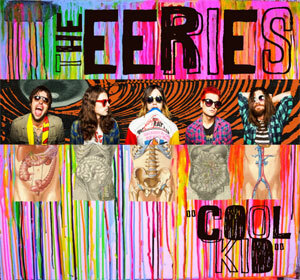 "Wish I was a Cool Kid"
After a long time in the making, The Eeries have finally released their début EP - 'Cool Kid'. And for those of you who enjoy great live music, and live in the Hollywood area, why not come down to Hemmingway's on the 21st of May and catch the band live! There's a lot been going on over the last couple of months, including: new recordings, some cool live shows, writing sessions, and a great opportunity to develop young musicians. 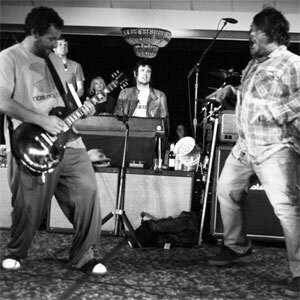 You might remember at the end of last year, I mentioned that Jack Black and I had joined Adam Sandler on-stage, at his Happy Madison Holiday Party. Well after a long wait, I'm happy to say this picture (courtesy of Mr Sandler) has surfaced to prove that it wasn't just a really weird dream... Here we are rocking out to a bit of Black Sabbath's, 'War Pigs'. There were many other acts having fun that night - Marilyn Manson, Ann Wilson, Joe Walsh, Slash, Valilla Ice and Tom Morello. Here's hoping I get another invite this year! I know all of the band would like to thank everyone who came out on March 1st to Satellite, in Silver Lake. It was a night of firsts. The first run out for a lot of songs that will be on the next Ep. The first time the band had played live with singer Laura Marion sharing centre stage with Tom Cusimano. 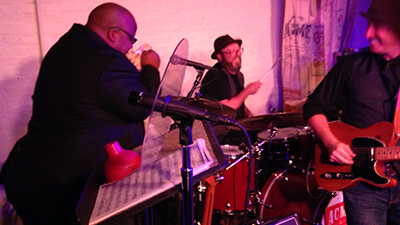 And it was also the first time I got to share the stage with musician Jamison Hollister, who played fiddle that night; A great player, and person. A fun night! And I'm really looking forward to a project we're involved in with Rami Jaffee later this week. It involves some recording and a few names you will know, but that's all I can say for now... But be sure to 'like' me on Facebook and 'follow' me on Twitter, cause I'll be posting pics of what we get up to! Over the past few months, I've been playing more standing up. Now for those of you who know me, and know everything I've got going on at my feet every time I gig (foot tambourine - sustain pedal - control pedal - expression pedal - dancing shoes), you'll know this could end up looking like a poor mans' Riverdance! But after watching this live video of The Wild Roses, live in The Viper Room I think you'll agree, it was good move. I'll be joining the 'Wild Roses' on stage, at The Mint, May 8th - For more details visit my Calendar page. This news update has really reminded me how lucky I am to get to work with the artists, and song-writers that I do. But also shown the different styles of music I enjoy, both on and off stage. Which brings me beautifully to Sara Kerr... It's been a real pleasure writing and working with Sara over the past four months. For those of you who don't know her, shame on you! 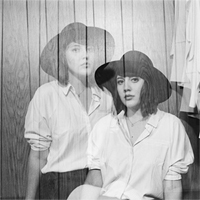 Sara is the former front-woman of the Glasgow Northern-Soul band, Button Up. (Yes, the band I used to play in too!) 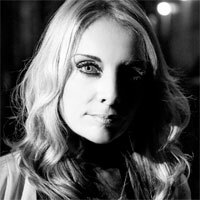 Sara's voice has also featured on many Northern Soul and dance tracks across Europe - and there's no question why. It's awesome. Thankfully eariler this year, we found an opportunity to start writing some original tracks together. --- My Very Own "School Of Rock"
And finally, I have been asked to assist the Brentwood Middle School music department until the end of the year. It's a great opportunity to work with some amazingly talented young musicians. Last year, I helped briefly ahead of their "Battle of the Bands", to open for Maroon 5. And what a great job they all did! I can see great potential for all of us in that classroom, and I look forward to every opportunity we have to work together! As a huge 'Doors' fan, I don't think many things could top the evening I had on the 16th of Jan, opening for Robbie Krieger. 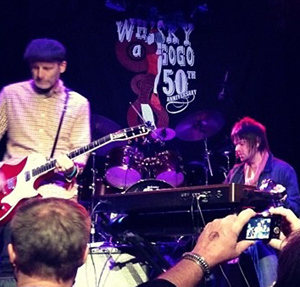 50 years to the day, The Whiskey A Go Go opened! The Wild Roses were asked to open at the prestigeous event, and I was only too glad we could all do it. Since moving to L.A. I've paseed the venue two or three times a week. It was 10 years ago I played it last, and since then it's urned more into a metal venue, that somewhere I'd usually play. But the history surrounding it will live forever, and that's what I grew up watching and listening to with some of my best friends. "The Doors, Live at The Whiskey A Go Go". I mean, everyone played there back in the day, and now I got to be in the band to mark the occassion... I was an absolute blast! There were a few classics in the set including, 'Love Me Two Times', 'Backdoor Man',' Wild Child', 'Touch Me', ' Riders on the Storm', and of course 'Light My Fire'. When I first moved to L.A. I had the usual "Hollywood" expectations of who I might meet and work with. I don't know why, because I've been over here loads of times, and I knew exactly what to expect. But there's a magic about moving to a new city or country, and an overwhelming sense of "what if?" For those of you who are fans of The Dropkick Murphy's, you'll remember their guitarist Marc Orrell. Well, The Wild Roses is his new project with the classic mixture of punk / rock / whiskey / tongue and cheek lyrics you'd expect from him. He's an awesome frontman with enough energy to lead three bands! For fans of blues and rock, there aren't many recent bands that have the respect of musicians worldwide, like The Black Crowes. So being part of the backing band for Marc Ford (ex-Black Crowes & Ben Harper) on Tuesday, was a huge personal goal met! So to set the scene... The backing band were all members of The Walcotts, as we had invited Marc to play at our weekly residency in L.A.'s, Harvard and Stone bar, on Hollywood Blvd. We met Marc at 3pm on te day of the gig, and the rest of the afternoon was basically a "getting to know you" jam session. I learnt a lot in the rehearsal room that day... A lot I'll be passing to band members and students in the future! So lets just say we had all the basic bases covered. But on top of that, we were fortunate enough to have the two-piece brass section that plays live with The Walcotts. So after dust had settled from The Walcotts set, Marc and the band took to the stage. Having only known each other for a few hours, we quickly got into our groove. 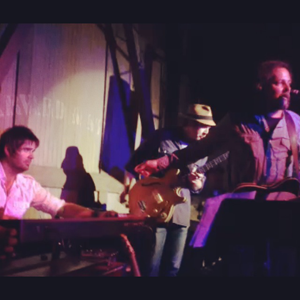 As I said before, was an honor to be up on that stage asthe keyboard player with Marc. I mean, the Hammond and piano are such a main part of his, and The Black Crowes sound, that it was an opportunity to "spread the wings", and play a style I've grown up listening to with my dad, and jamming with bands back in the U.K., but this was a whole new level. Needless to say, it was a blast! The highlight for me (pictured above) was when we finished playing the song 'California' and Marc announced to the crowd: "Greg here's a badass..." All I can say is I think he liked my playing - It was a moment I won't forget in a long time. There were so many other highlights: The groove of "Idle Time" with the girls doing outstanding backing vocals. The jam we had at the end of "Steady Rollin' Man". Or the beautiful simplicity of "Elijah"... all stand-out moments. But all too soon it was over, and as he took his final appluase, Marc turned round to share some humbling and personal words with me. A moment I'll never forget. I'm not gonna lie, the backing band had to work damn hard for their reward, but it was well worth it! And I know I speak for everyone when I extend a huge thanks from us all, to Tom Cusimano for making it all happen! I've only been to San Diego a few times in my life, but I've always enjoyed it immensley. 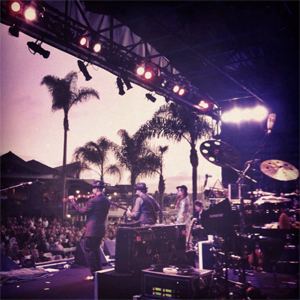 On the 3rd of August, I had the pleasure of opening for Chris Isaak, with The Walcotts, at Humphrey's by the Bay. For those who haven't been there, it's an intimate outdoor venue, over-looking the bay. A perfect photo opportunity to be playing as the sun goes down. If you were to talk about the real show-men that are around nowaday's, you'd have to put Chris Isaak in the mix. The band is obviously tight, with the "newest member" having srver 18 years with him. But I was really impressed with how he intereacted with his audience. They obviously knew what to expect from his show. It was a lesson in showmanship. He even ended up singing a song while walking through the crowd, leaving enough time to take photos during the lyrics! Anyway, I hope to be down there again soon. They have a pretty impressive line-up of artists playing over the coming months, and I wouldn't mind getting on that stage again once, or twice! What a pleasure it was to play a sold-out Troubadour on the 25th Feb, with "drunken bar-room" / country-rock /dixieland band, The Walcotts. As they opened for a man they call the White Buffalo. Let me describe the gig to you in three letters... WOW! It's been a number of years since I first played the Troubadour's stage, and those memories are still up there with some of my all-time favourites. But it really is special when you can play a solid gig with a band, leave the stage to watch the other acts, and be equally as excited and appreciative of every other musician you get to see playing that night. Maybe even become a fan. It was certainly great to chat with trumpet player, Danny T. Levin (www.mushroomstamp.com). We've been trying to catch each other at a show now for a while, and quite unexpectedly bumped into each other at the gig. Danny who was playing with Matt Ellis on the night, and he was tremendous. So it was a good night all round, and I hope it will be the first of many at The Troubadour this year! Well unfotrunatley not us this year, but it was still a pleasure for The Rambles to be asked to play at the Grammy Label party in Hollywood. 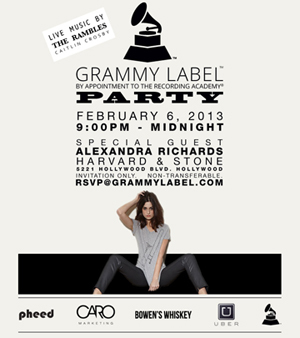 I'm learning pretty fast about how all the secret parties / shows / events, that go on behind closed doors in L.A. Last night The Rambles were asked to perform at an invite only, event at Harvard and Stone, Hollywood, for the Grammy Label party. And what party would be complete without FREE Whiskey! Courtesy of Bowen's. Anyway, the band had a blast. It was just a short four-song set, but we still had time to try out a new song, as well as some of the new arrangements we've been working out while we've been recording. Don't worry, you'll all get to enjoy them soon enough. There was a lot of press and paps out, so I'm sure there will be some pics online. If I find and I'll post them! A big thanks to whoever let us come and crash your party! I'm very proud to announce that some music I have written and recorded was used on an App for the animated film, 'Hotel Transylvania'. The App itself is called 'Hotel T Me'. It allows the user to take a photo of him or herself and become animated versions of two of the main characters, Frankenstein (Kevin James) and Mavis (Selena Gomez). The App is a lot of fun, and best of all it's FREE! Hotel Transylvania is an upcoming American 3-D computer-animated comedy film produced by Sony Pictures Animation for Columbia Pictures and set to release on September 28, 2012. It is directed by Genndy Tartakovsky (who is the creator of Samurai Jack, Dexter's Laboratory, and Sym-Bionic Titan) and produced by Michelle Murdocca. The film will feature the voices of Adam Sandler, Selena Gomez, Andy Samberg, Kevin James, Fran Drescher, Jon Lovitz, Cee Lo Green, Steve Buscemi, Molly Shannon and David Spade.